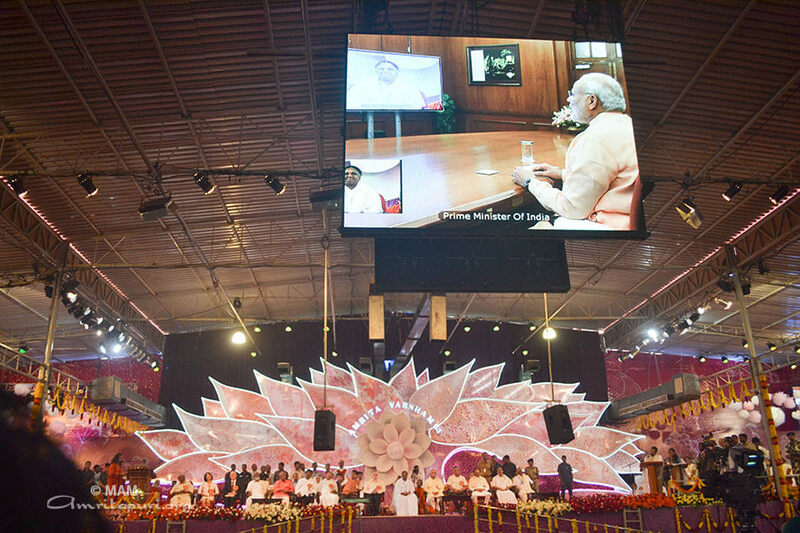 Prime Minister Narenda Modi gave his speech during the occasion of Amritavarsham 63 via video conferencing. 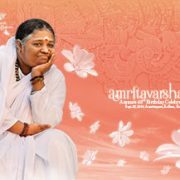 On this pious and sacred occasion, I offer my deep regards to Amma. I also pray to the Almighty to give long life and good health to her. She is the guiding light for millions of devotees. Not only that, she has become the synonym of life for many devotees. Like a real Maa, she nurtures her devotees through direct and indirect acts; visible and invisible hands. I am very fortunate to be among those who have been receiving Amma’s blessings and unconditional love. 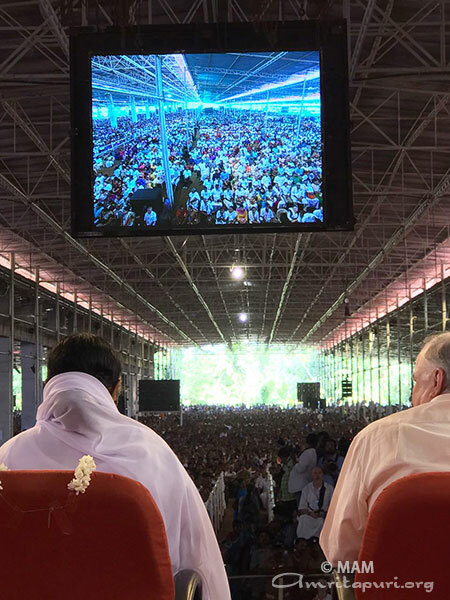 Three years ago, I had the opportunity to be present at Amritapuri, to pay my respects on the occasion of Amma’s 60th birthday celebrations. 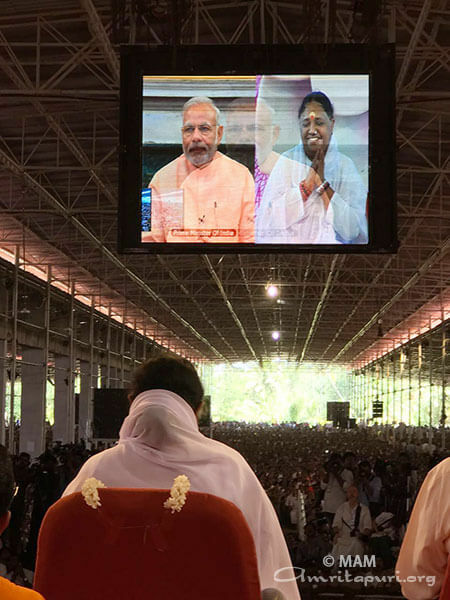 Today, though I am not so lucky as to be present at the celebrations in person, I am delighted to be able to greet her, through technology. 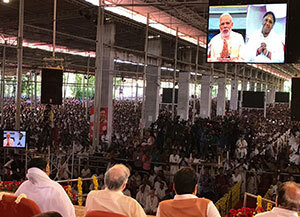 I have just returned from Kerala, and I was touched by the love and affection showered on me by the people of Kerala. 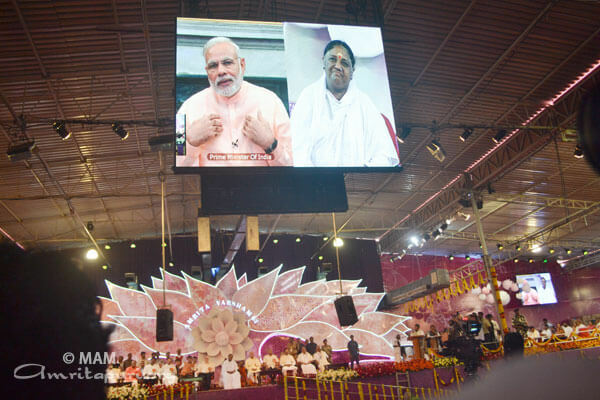 India is the land of such saints who have seen God in everything that can be seen. Mankind is prominent among those things. That is why service to mankind has become their main motto. 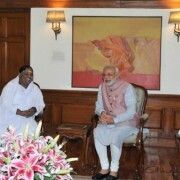 I am aware that even in her childhood Amma was fond of giving her own food to others. Serving the old and the aged, and helping the needy have been her childhood passions. Also, she used to worship Lord Krishna in her childhood. These two qualities have been her strength. 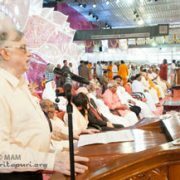 Devotion to God and Dedication to the Poor is thus, the message which I have personally taken from my association with Amma. 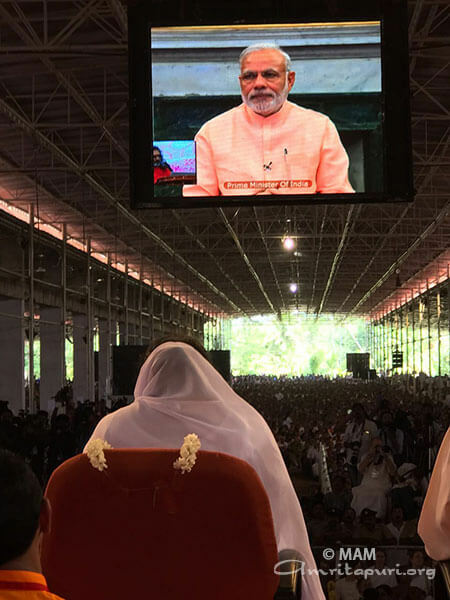 Millions of devotees from all over the world also believe in the same. 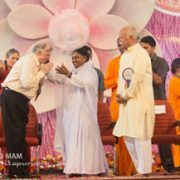 I am aware of the social and charitable works done by various institutions and programmes run by Amma. She is always keen to help the world’s poor in meeting their five basic needs: food, shelter, health care, education, and livelihood. I would like to particularly mention the works done and donations made in the field of sanitation, water, housing, education and health. I understand that some of those beneficiaries will get their certificates today. 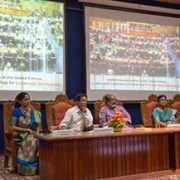 Particularly, Amma’s initiative on building toilets has been a great help in our Swachh Bharat Programme. 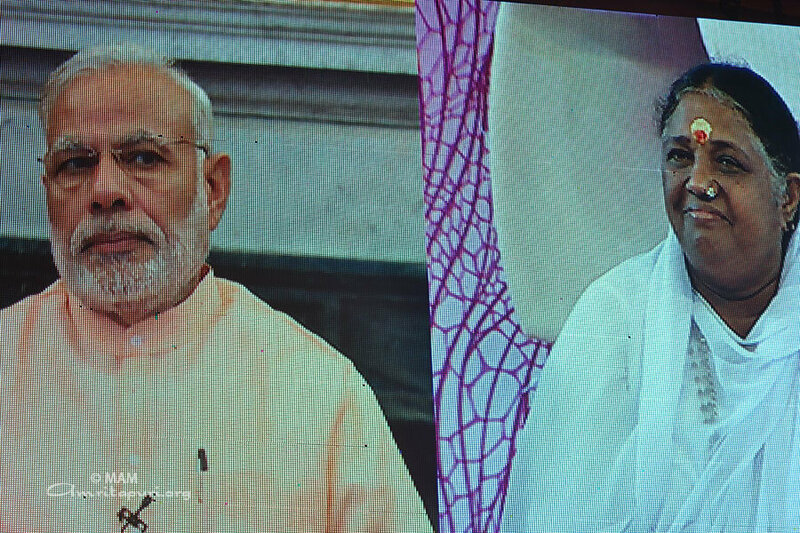 Amma has pledged to contribute one hundred crore rupees towards sanitation efforts in Kerala. 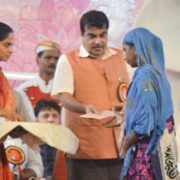 This pledge includes the construction of fifteen thousand toilets for the poor. 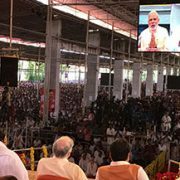 Today, I am informed that throughout the State, Amma’s ashram has already completed construction of two thousand toilets.